This is a follow-up to my previous post on the xbox 360. Since I'm avid fan of the xbox console, I'm rather excited with news on the xbox 360. Anyways here it is folks, the actual xbox 360 design! This one is taken by the ppl of xbox365. From the screenshot, the console is accompanied with a new Live headset, controller and camera! 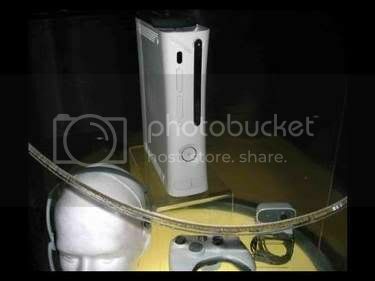 According to the xbox365, this shot was taken at the recent MTV airing which will reveal the console itself on May 12th. No idea how these guys got this shot off but it's pretty interesting nonetheless. 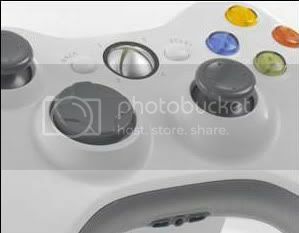 Another image of a controller, this time showing the center button. Here's another interesting spin to the xbox 360. It seems Microsoft was considering the platform as a potential challenger to Apple’s iPod: a game console with a portable storage device that also serves as a music player! If this is true, the explains Microsoft's impending strategy to be more Apple-influenced than expected. If you've noticed, the xbox 360 shots above and below have been widely described as highly Applesque in person, but what’s coming next are the commercials and the spin. Apparently, the xbox 360’s going to be pitched globally as the “must-have” gadget of the year, and its music functionality is going to be a major emphasis of the campaign. Here's the hard part, Microsoft plans to sell two versions - one at USD$299 (without portable drive), one at USD$399 with the portable drive - with 80% of the initial consoles being the more expensive one. Ouch! We'll wait for the official news at the debut tomorrow.